The Road Less Travelled: Yeah Ethiopia!! The Ethiopian athlete, Tirunesh Dibaba, has won Africa's first gold medal at the Beijing Olympics. 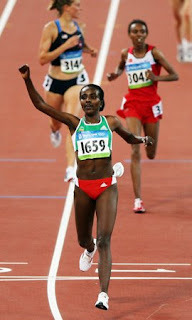 She won gold in the women's 10,000 meters race, the first of her career. The 23-year-old joined compatriots such as Kenenisa Bekele and Haile Gebreselassie by setting a new Olympic record time of 29:54.66s. Dibaba ran her way to victory by outpacing Elvan Abeylegesse, also a native of Ethiopia but now representing Turkey, and Kenyan-born Dutchwoman Lorna Kiplagat. Read about it here. Kenenisa Bekele of Ethiopia wins the gold medal in the men's 10,000 meters today out sprinting his competitors at the last lap. His compatriot Sileshi Sihine won silver. 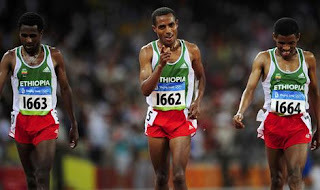 Haile Gebreselassie did not get medal. Read about it here. 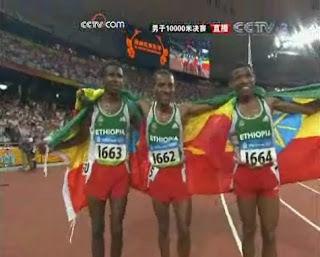 We all watched the Ethiopian's olympic race and were THRILLED to cheer them on to gold. Silas was grinning from ear to ear as we talked about his home country and cheered as the gold and silver winners did their victory lap. That is so cool! Thanks for sharing this, I wasn't able to watch. Also, thank you for praying for Steve with me. So sorry we missed meeting you and your family by just one day in Ethiopia, but are so glad we met "Baby." Yay - Ethiopia! Your little man is getting so much bigger! Just too cute for words!